Nya's Room | A crafty little blog. SWALK Pawfect Pals – Sneak Peek no.3 for today! I know you want to see more before the launch of the SWALK Pawfect Pals range tomorrow so I thought I would give you another image. This time it’s a dog! Every SWALK character in this range is shown with a pet/animal so this range is perfect for all the animal lovers out there. I coloured this little person as a boy but you could easily turn the character into a girl by changing the colour of the outfit. And of course the dog would look just as lovely in black, brown or even purple if you are feeling brave! 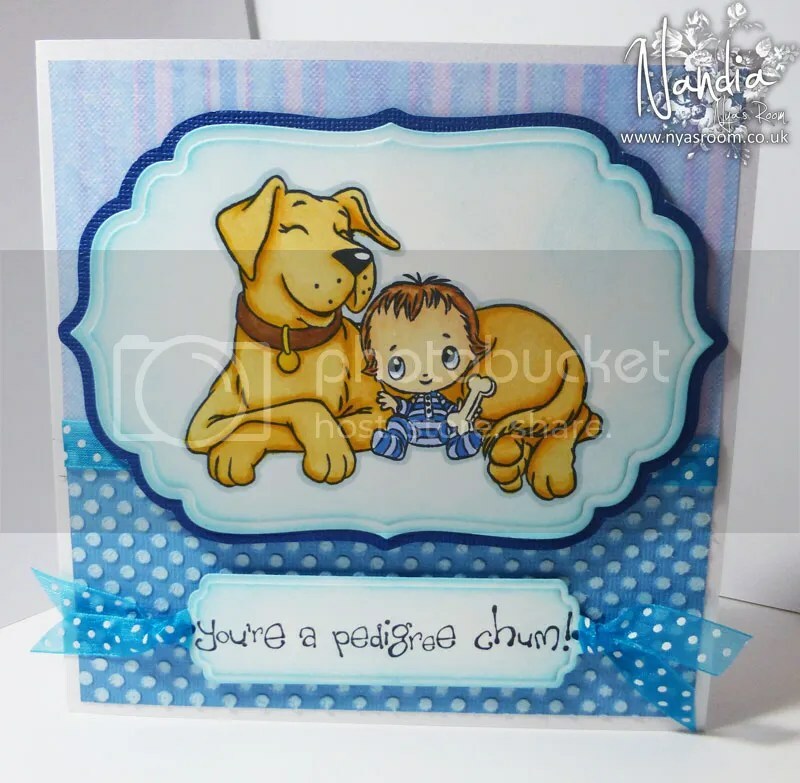 I used my Spectrum Noir pens to colour the image, the Petite Dots embossing folder by Crafter’s Companion and a backing paper from the Pawfect Pals CD-ROM for the background. Hope you like it! I just had to give you another sneak peek for today! I had so much fun colouring these stamps so I have to show you! 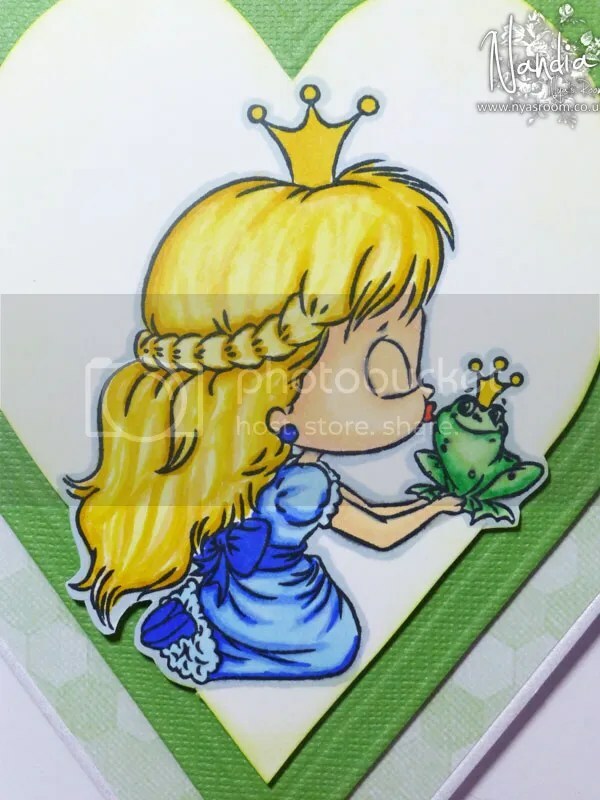 This one is the little princess kissing the frog. Isn’t she cute?! Again, I used my Spectrum Noir pens to colour the image. 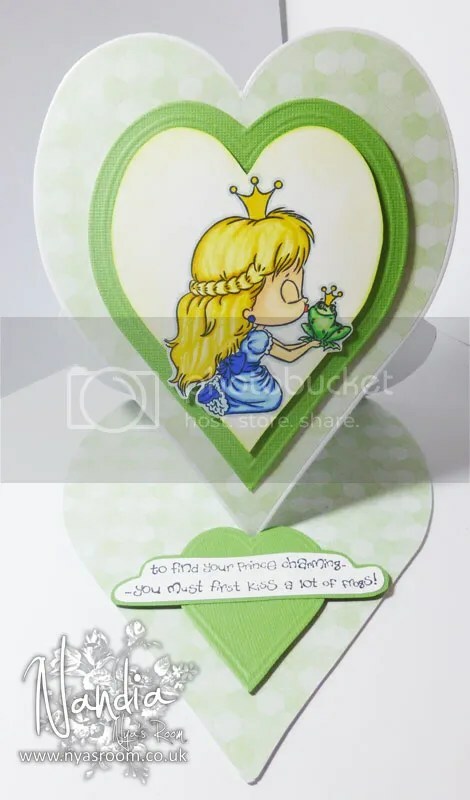 To make the heart shaped easel card I used the Crafter’s Companion Ulti-Bags board. See? You don’t have to use it just to make boxes! 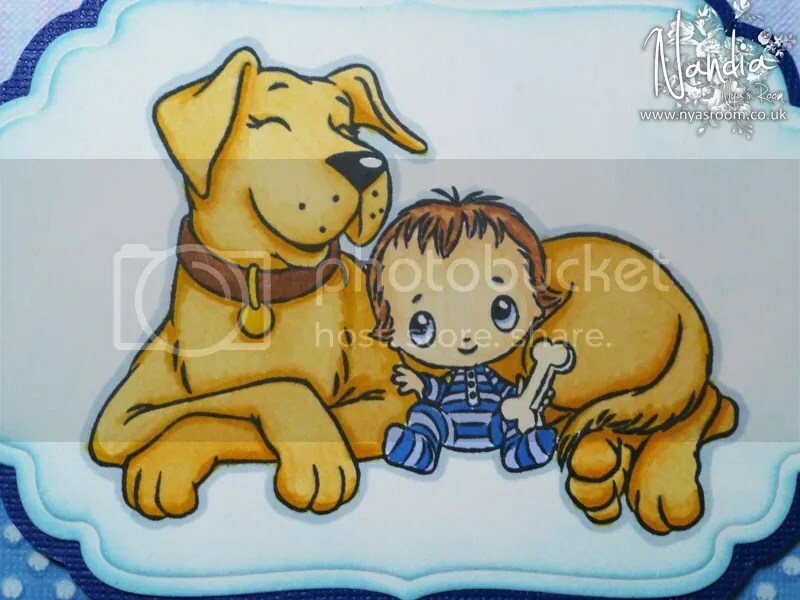 The backing papers are from the SWALK Pawfect Pals CD-ROM. The stamps and the CD-ROM will be released on Friday so make sure to check the Crafter’s Companion News Blog for more information and more sneak peeks!!! I have a little sneak peek for you today. It’s one of the new SWALK Pawfect Pals stamp. And yes, it’s a kitty! It’s no secret that I love cats so I can immediately drawn to this image. The backing paper is from the Pawfect Pals CD-ROM. Most papers have a lovely texture and they look really good. You have to wait a little bit more before you can get your paws on this stamp and CD-ROM – but it’s not long now, Friday is almost here! Make sure to visit the Crafter’s Companion blog for more information and for more sneak peeks! I wrote a little piece for the Crafter’s Companion News, Views and Inspiration blog which you can read by clicking the link. It’s a little bit about how I got invited to the Design Team and how exciting it is to belong to the Crafter’s Companion family. And it is really a family because that is how everyone makes you feel. And not just now that I am in the Design Team but way before that. Before my first meeting with Sara, Leann and Meg I felt a bit intimidated/worried to meet people that I kept seeing on tv and frankly (because I had met some other “crafting celebrities” before in workshops) I kept thinking that they’d be very cold with a “lets get this over with” attitude. Boy I was wrong!!! Those two days Sara, Leann and Meg made me feel like I was meeting old friends and doing crafting with them. Sara even prepared my coffee because I was so busy crafting! And hearing the story about how Crafter’s Companion started, by Sara, sitting in the meeting room at Crafter’s Companion HQ is an amazing memory to have! And it’s not just Sara, Leann and Meg. I wish all of you would be able to meet everyone that is working for Crafter’s Companion and feel what I am talking about. Everyone I’ve ever met, from the people pressing the stamps or packing the shipments to the ones working at Customer Service, have been so friendly, welcoming, helpful and simply amazing! And I haven’t even mentioned Sara’s mum and dad who are such a lovely couple! I am so glad I decided to create a card for the 5th birthday! Even though at the time I kept putting it off and I wasn’t sure my card would be good enough I am glad I did it. It took me two nights to finish the card and all the time I kept thinking how lovely it would be to win it – Dare to dream I guess! 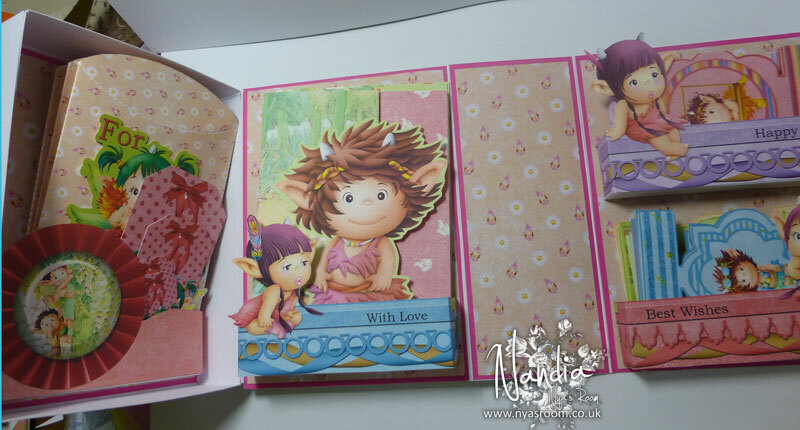 This turned out to be a long post… I only wanted to give you a link of my Crafter’s Companion 5th birthday card and look at how much I wrote… hope I didn’t bore you too much! Thank you for reading and Craft On! I know I’ve been away for quite a while and I apologise for that. I was in Greece getting married and then I was on my honeymoon. I promised I’ve make one so here it is! I took a lot of pictures, I hope that makes it a bit easier. It is not a difficult project but it needs some time. I believe that once you make one you can easily make more quickly. I would LOVE to see what you created using the tutorial. If you have any problems just leave me a note and I will get back to you. And if you have time and you want to leave me a little note I would be extremely happy to read it and see what you think. Just another quick sneak peek from Nigel’s A-May-Zing double CD-ROM “Craft into Christmas”. 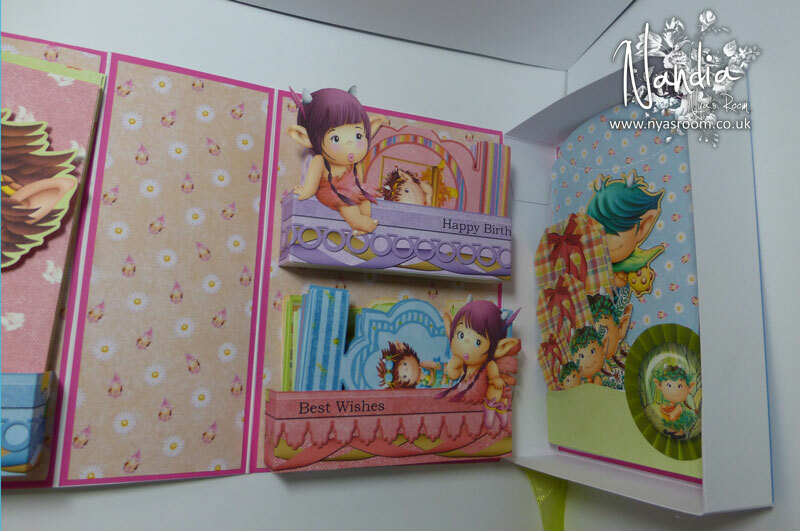 It’s a trifold card (I love making them) with a twist – it has a fourth panel on the front! 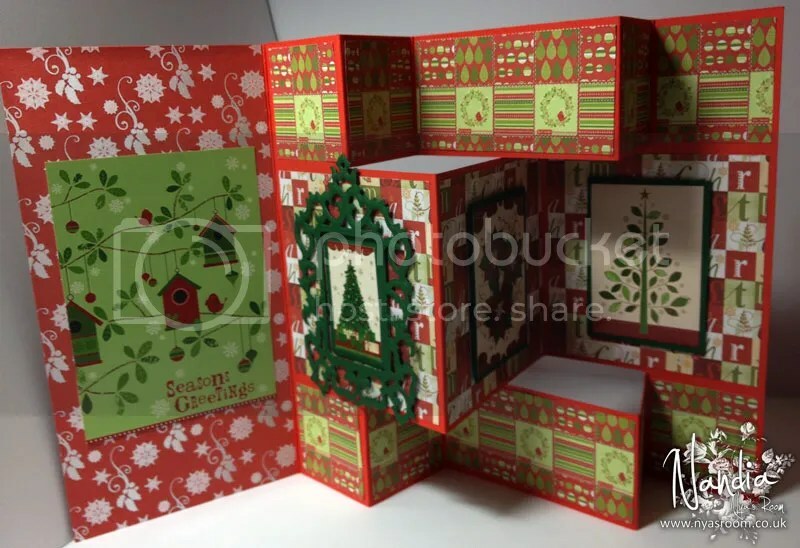 …but when you open it inside, it’s a trifold card! 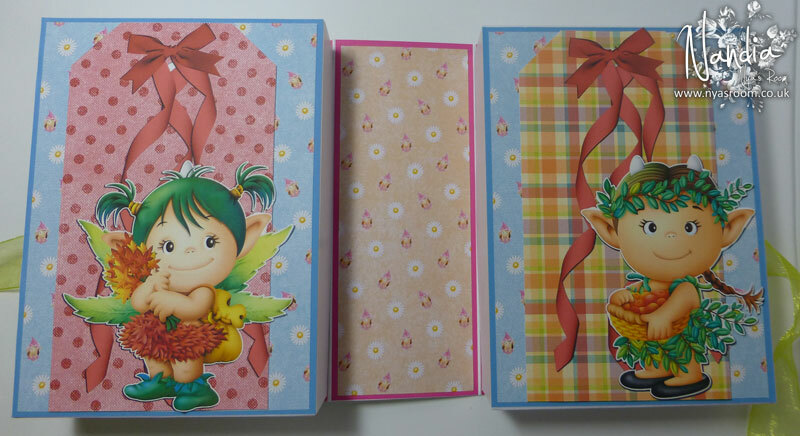 The additional images are from a toppers sheet and they co-ordinate brilliantly with everything else. Thank you Nigel for thinking of everything! Not too long now until the launch! 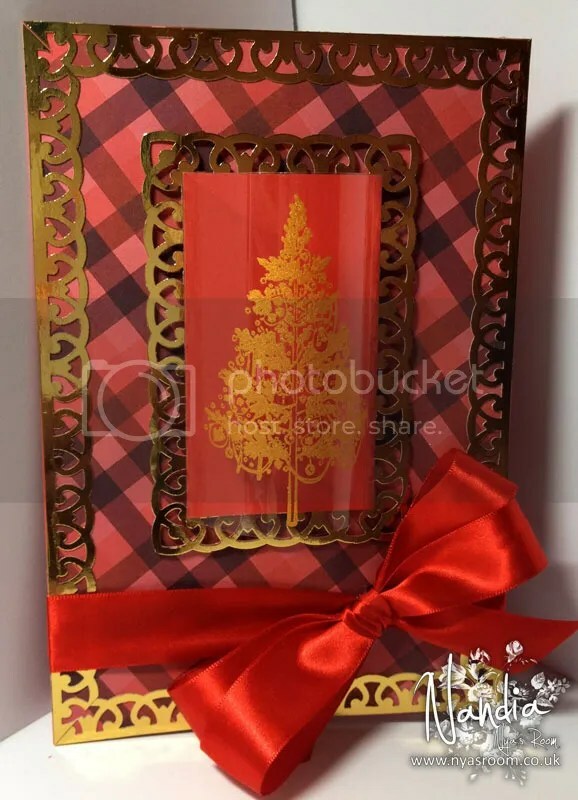 Today I bring you an easel card I made with Nigel’s A-May-Zing Craft into Christmas CD-ROM. The twisted pyramage topper and the backing papers are from the 2nd CD-ROM. Nice and easy straight lines to cut and so easy to put together especially if you are using the Collal Glue Gel which gives you the time you need to align the layers – and afterwards you are 100% sure it will not come apart which is what I find sometimes with some foam pads. I’ve also used a bit of red card and some gold mirri card. 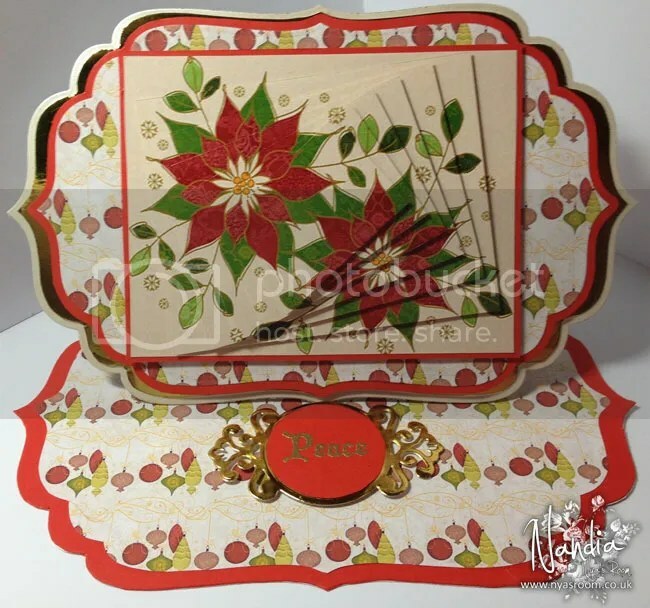 The “Peace” sentiment for the stopper came from the Christmas tree stamp, I just stamped it on red card with Versamark, sprinkled it with Sheena’s Gold fine embossing powder and then heated up with my heat gun. I believe it is a lovely, festive card which would be ideal to give even to those of your friends who don’t celebrate Christmas but you want to wish them a happy festive season. Make sure you watch the shows on Create & Craft on Tuesday 19th June! Second sneak peek for Nigel’s new “Craft into christmas” CD-ROM and stamp range. 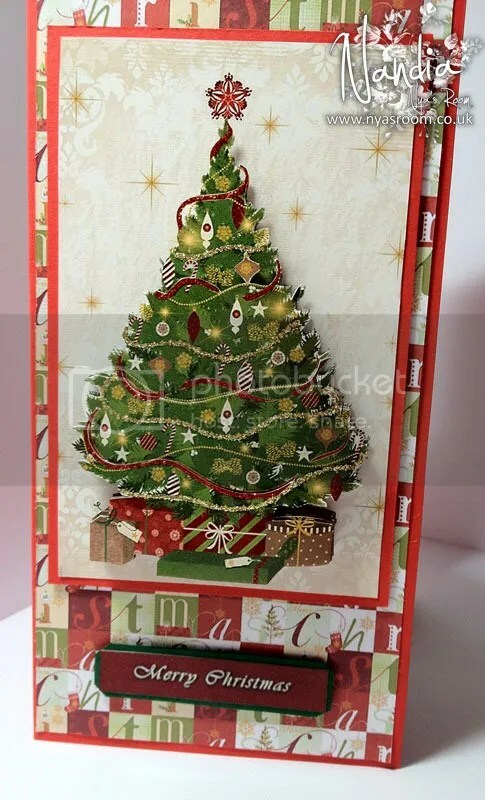 Today I picked to show you a card I made using the christmas tree stamp. It is a very intricate stamp but was suprisingly easy to colour. 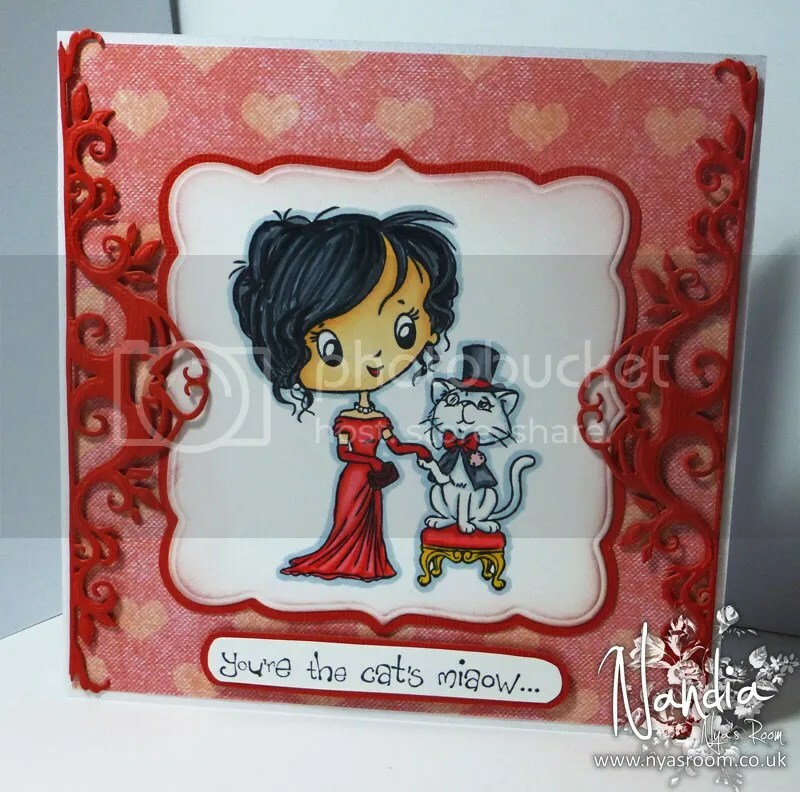 In this card I chose to stamp it on acetate with my glue pad (it’s an ink pad that has glue!) and then use some fine gold powder. I left it to dry and then I buffed it. I mounted it on some red card making it into a dome. The gold tree looks almost 3D! I was really pleased with how it turned out. Here it is! It looks much better up close as you can see the tree pop out. The backing paper is from Nigel’s Craft into Christmas CD-ROM. The punch that I used to make the border is by Martha Steward. And of course some red ribbon! 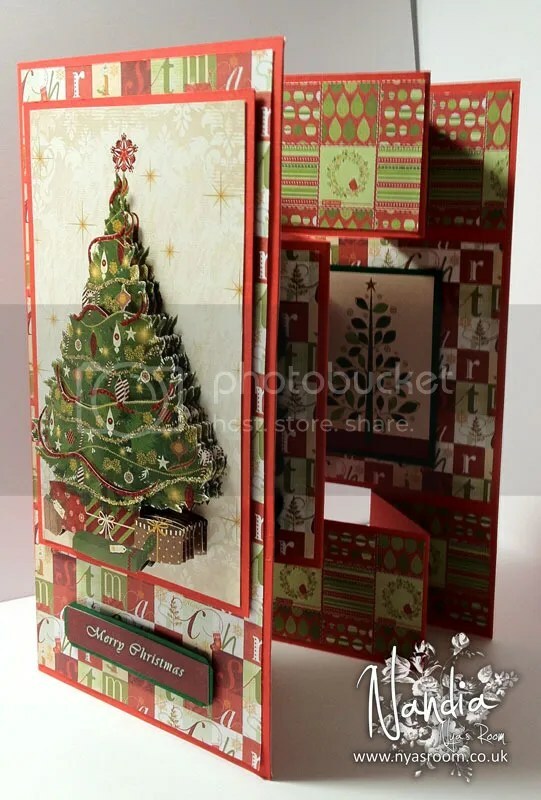 If you would like a chance to win the whole Craft into Christmas range just put the image below in your blog or Facebook page and then enter a link in the Crafter’s Companion blog using Mister Linky. So what are you waiting for?! I promise you, you will love this new CD-ROM so go ahead and enter the competition to win it and all the stamps! But here I am now with something I know you’ve been waiting for! Sneak peeks of Nigel’s new christmas DOUBLE CD-ROM “Craft into Christmas”. Yes double! A really feminine card for those ladies that really love their high heels (who doesn’t?!) I’ve mounted the card companion onto an A5 card as I wanted something different so if you don’t want to limit yourselves to the design, you have other options. I’ve decoupaged th boot and added some glitter to make it more sparkly. Just a little bit of ribbon and the matching backing paper printed from the CD-ROM and here it is, an A5 card. 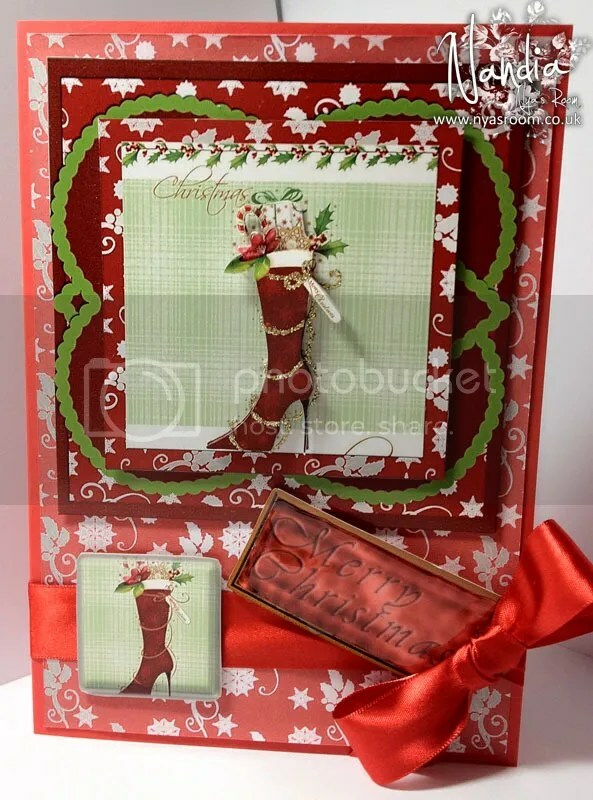 The little embellishment and the tag are from the same card companion sheet so you don’t need to print anything else! I’ll be back tomorrow as I have lots more to show you! Make sure you watch the shows on Create & Craft on Tuesday 19th June as you won’t want to miss this! I can’t believe it’s been so long since I last blogged… It feels like it was only last week. I have no idea where April went it’s now May and June is approaching fast. Gah! I need more time in my days! The weather has been horrible, so much rain and cold… I need some sunshine in my life, I need something to recharge my batteries! What really helped me cope with all this bad weather is colouring these beautiful new SWALK stamps. Butterflies! I wish the weather would get better so we could see some butterflies but for now here are some coloured ones. 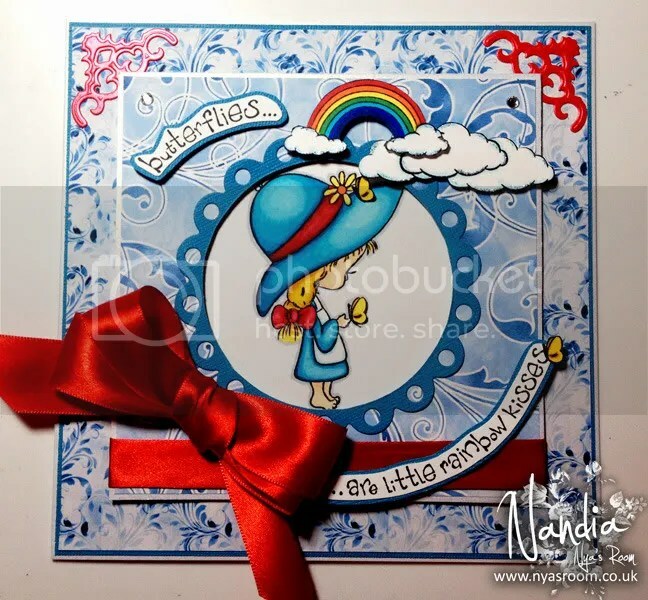 The image is coloured with Spectrum Noir pens and I was a bit bold adding blue ribbon but it worked! I think that blue and red is now probably my favourite colour combination! The rainbow and the cloud along with the sentiment are on the same plate. I’ve masked the cloud and stamped 3 overlaping eachother. 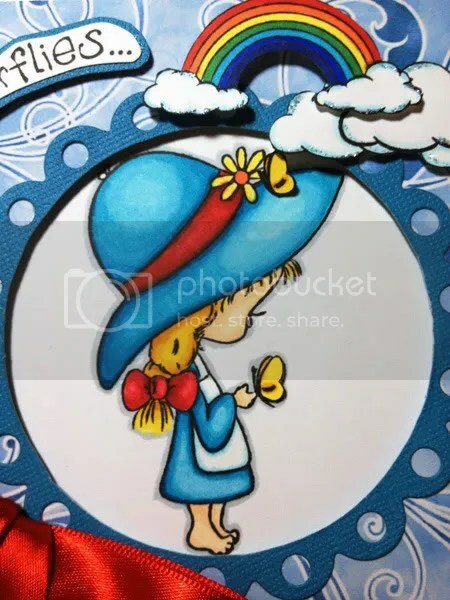 I also used the little individual butterfly that also comes on the stamp plate and added one on her hat and one on the sentiment. And of course the clouds needed some glitter! I will put the Spectrum Noir pens numbers I used on here later as I don’t have them with me at the moment. for a chance to win the 12 new stamps and the Resource CD – together they are worth over £60!!!!!!!! 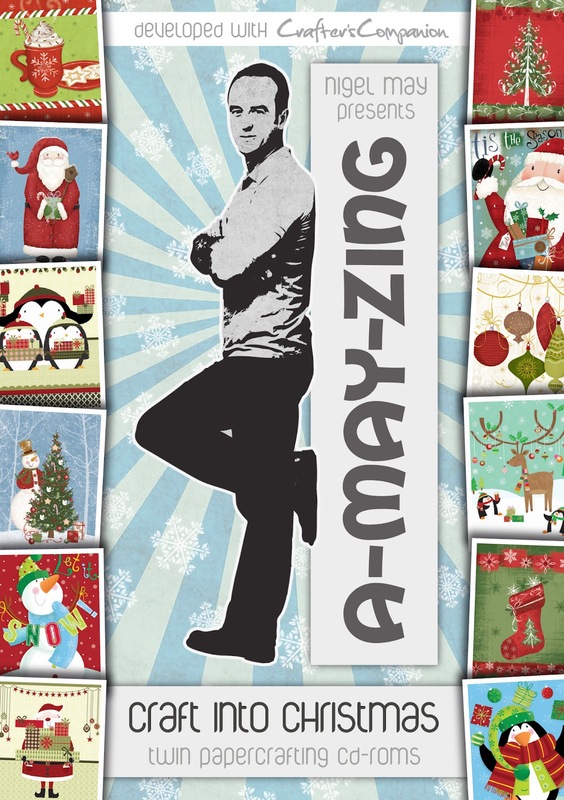 Also proud to be one of Nigel’s A-May-Zing Angels!